Less than a year after Senator Rand Paul gave a keynote address at the 2015 Las Vegas EB-5 Conference, he delivers on his promise to "make the program bigger and even better," and introduces legislation that will expand and make permanent the EB-5 program. In the latest EB-5-related bill to hit the Senate floor, Senator Rand Paul introduced on October 1, 2015, the most open-handed, favorable legislation to-date for the reauthorization and renewal of the EB-5 Regional Center Program. Click here to access the bill. The Invest In Our Communities Act, Bill S. 2122, comes at a critical time for an industry that brings billions of dollars and tens of thousands of jobs to American businesses and workers. Just the day before, on September 30, 2015, Congress temporarily extended the EB-5 Regional Center Program through December 11, 2015. Senator Paul's bill proposes permanently protecting and bolstering the economic stimulation and job creation power for local and state economies across America. Senator Paul's approach to the EB-5 program, as laid out in S. 2122, is straightforward. The bill offers simple solutions to root issues that, if passed, would resolve many of the hotly-contested topics that have plagued previously proposed legislation. By expanding the number of visas, S. 2122 could ease controversies over which regions are able to gain EB-5 dollars and jobs. The issue, which divides legislators and industry stakeholders alike, primarily stems from a conflict over which areas should qualify as Targeted Employment Areas ("TEAs"), or areas in which the EB-5 investment amount is $500,000. Instead of entering the argument about how many visas get allotted where, S. 2122 cuts to the fundamental issue: insufficient visas to fulfill the demand in both urban and rural projects. The demand is certainly there on both sides. Various EB-5 industry members estimate the backlog of EB-5 petitions queued at 13,000 to 15,000 visa petitions. American businesses are increasingly leveraging EB-5 funds, and thousands of American jobs are created at no cost to taxpayers. The money is there, the investors are there, and only visa limits are keeping the jobs from being created. S. 2122's proposed reforms could fix that for communities across America. "It's important to help our economy by creating U.S. jobs,” Senator Paul commented after introducing the bill. “EB-5 is a program which is premised on that principle. I advocate for expanding this program and creating more U.S. jobs." Raising visa numbers for the EB-5 category and removing derivatives from the EB-5 visa quota, S. 2122 sets itself apart from Senator Patrick Leahy and Senator Chuck Grassley's recently introduced S. 1501, which%20attempts%20to%20use%20various%20regulations%20to%20modify%20the%20distribution%20of%20EB-5%20investments">which attempts to use various regulations to modify the distribution of EB-5 investments. In contrast, Senator Paul's bill not only frees up more visas for investors to contribute to the economy, but it also eases up on bureaucracy. Instead of burdening the program - and taxpayers - with more bureaucratic regulation, S. 2122 expands a free market system while also including measures to enhance its integrity and transparency. 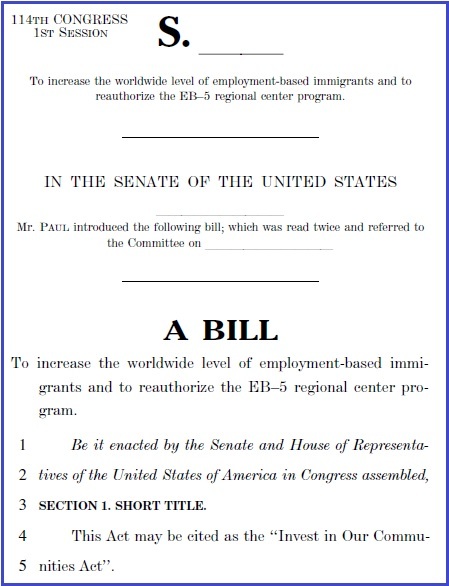 Bill S. 2122, along with S.1501 and S. 2115, is the third piece of EB-5 legislation introduced in the Senate this year. EB-5 Stakeholders: share this post among your LinkedIn, Twitter and social media networks, and join in the EB-5 advocacy efforts yourselves by making the public aware of EB-5 program facts!